All health centers funded by the Health Resources and Services Administration (HRSA) must have in place a system to improve patient care and outcomes. 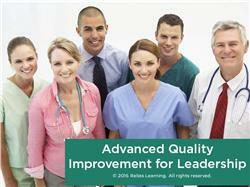 This system is your center’s quality improvement (QI) program. While improving patient care and outcomes is the primary benefit of QI programs, there are also financial benefits for your center. In fact, the Department of Health and Human Services (2014) has appointed $36.3 million in funding to centers that meet or exceed quality improvement measures. Although most health centers have some QI functions established, many have not implemented a comprehensive, organization-wide quality improvement program. This course will enable your health center to take a comprehensive approach to implementing QI systems. In this course, you will learn about the essential elements of the QI infrastructure, systems, and programs. You’ll learn how to identify quality-related problems using proactive strategies, such as peer review and patient satisfaction surveys, as well as reactive strategies, such as patient complaint tracking systems. Additionally, you will see how you can put the FOCUS-PDSA model into action. Describe the components essential to a successful quality improvement program. Use specific proactive and reactive QI strategies in your health centers QI program. Use the FOCUS-PDSA model to put a QI initiative into action. The target audience for this course is: intermediate and advanced level Alcohol and Drug Counselors; intermediate and advanced level Nurses; intermediate and advanced level Professional Counselors; intermediate and advanced level Social Workers; in the following settings: Health and Human Services.